Guy Gsell's dinosaurs are pretty tough. Predators cannot eat them. They are highly resistant to rain, screaming children and bugs. Experts regularly cut their skins with sharp knives, but the dinosaurs heal quickly and show no scars. They breathe and roar and blink their eyes in hot weather and cold, impervious to every element but one. "The only thing that can hurt them is snow," said Gsell, who talks about his dinosaurs the way a loving but clear-eyed father speaks of a clumsy child. "If the snow sits on their backs it can damage them, especially if it's wet and heavy." 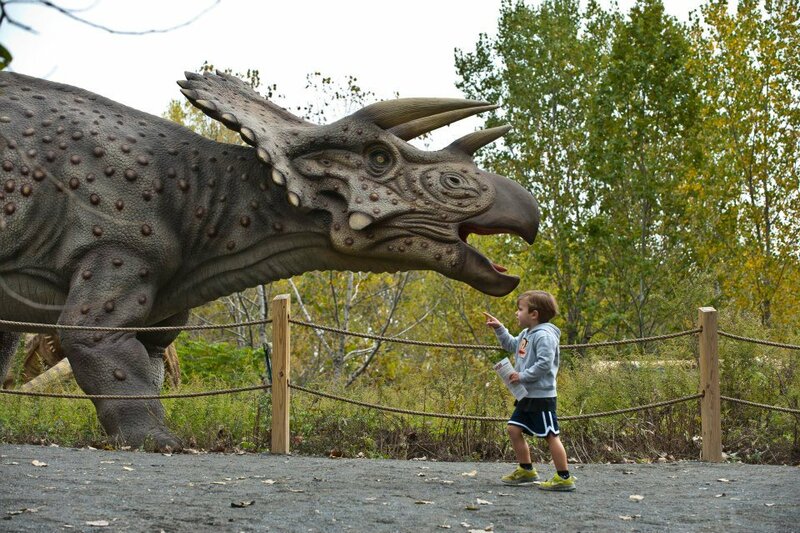 Gsell is the founder of "Field Station: Dinosaurs," an attraction that features 32 robotic dinosaurs. The creatures are tucked into the bends of old dirt bike trails in the scrubland behind Snake Hill, the ancient volcanic plug that rises from the Secaucus marsh. Others stand on hilltops overlooking the New Jersey Turnpike's eastern spur. The big ones, including an adult Tyrannosaurus rex and a beige Argentinosaurus that's 90 feet long, never leave. They function as billboards, especially in winter, when drivers on the turnpike and people in the high-rises of Manhattan can see them through the denuded trees. The smaller dinosaurs hibernate. Some remain in place, covered by tarps. "They're like horse blankets," Gsell said, "but they're just regular tarps from Lowe's." The baby triceratops wintered in the lobby of the State Museum in Trenton. The herd of juvenile Dilophosauruses was packed into a steel shipping container next to an orange pterodactyl. Now it's finally spring, and Gsell and his small team of laborers are retrieving the dinosaurs from cold storage. They must work quickly, balancing their desires for prehistoric verisimilitude with the need to finish by Wednesday, when the first group of schoolchildren arrives. "We turn a mud pit into a theme park in 3 1/2 weeks," said Gsell, whose previous work in educational theater includes serving as founding director of Discovery Times Square, an exhibition space that has hosted large shows, including "Titanic: The Artifact Exhibition" and "Leonardo da Vinci's Workshop," in the heart of Manhattan. "I had to position the Porta-Potty," he said. "I've never done that before." One worker at Field Station: Dinosaurs, Cosimo Landolfo, started his day at 5 a.m. with a drive to Trenton to retrieve the juvenile triceratops. By midmorning, the box truck sat in the dirt parking lot, its rear door open and the dinosaur's tail sticking out. Landolfo and three other workers placed their hands on the robot's belly and lifted. The dinosaur's head has a bony plate and three wobbly horns, and was heavier than they expected. The thing tipped forward, and its chin bashed the tailgate. "Ow! He's going to have a bruise," said Gsell, smiling as he rubbed the robot's jaw. The workers lashed the dinosaur to the blades of a forklift with a thin white rope. The forklift grunted up the hill. Stanley Capers, the driver, got the dinosaur past a clump of trees by fully extending the machine's arm. For a few seconds, a triceratops floated 15 feet in the air. As Capers deposited the dinosaur on a hilltop beside its mother, the others argued about its exact position. Should the juvenile point away from its mom? Should it face the same way, as though trotting alongside? The men split the difference, rotating the robot 45 degrees. "Let's twist him this way so people won't see his weird eye," said a worker named Oneil Rodriguez, pointing to the dinosaur's yellow right eyeball, which has air bubbles in the glass. Every dinosaur at the park was handmade in the city of Xigong, China, by a company called Jade Bamboo — one of the world's leading manufacturers of custom dinosaur robots, said Gsell, who also toured dinosaur factories in Texas, Kansas City and France. Construction started with a steel skeleton laden with electric motors attached to motion sensors, which detect approaching children (and their taller chaperones). When humans draw close, some dinosaurs wag their heads. The T. rex pivots its hips, as though it's trying to rip free of its pedestal and give chase. The juvenile triceratops blinks its eyes using a windshield wiper motor from a car. And every robot at "Field Station: Dinosaurs" roars. "Last year we worked with a paleontologist and a sound designer to redo all their voices," Gsell said. "Now the T. rex really has some bass." The metal bits are covered in blocky squares of foam, which are carved to the correct shape and painted. If a motor breaks, mechanics slit the foam with knives to fix the moving parts. Artists come by later to patch the hole and repaint the hide. "The scenic artists are so good, you can't tell anything ever happened," Gsell said. In addition to positioning each dinosaur for maximum surprise, the workers must take logistical problems into account. Each robot draws power from a black tube of electrical cable sticking out from one hoof. Wherever the dinosaurs roam, their cords must reach outlets drilled into the rock. As Gsell's workers hoisted dinosaurs through the park, a crew from Aggreko, a generator rental company, installed a diesel-powered generator and laid power lines along the ground. "All the electrical equipment is removed every winter, so we have to get the park powered up," Gsell said. "That always is the hardest job." Positioning dinosaurs is the fun part. The only robot in the park with a nickname is Dimitri, short for Dimetrodon, an early meat-eating reptile with spines down its back. Each workman hooked a shoulder under the 180-pound machine, lifted, and started walking. "Yup. We're carrying a giant lizard up a hill," said Kevin Guillaume, a worker. At the top, they set the robot on the ground and nudged it toward the edge of a cliff. "Stop! One foot farther and he'll fall," said Rodriguez, who watched the dinosaur wobble on uneven ground. "Let's shimmy it with a rock."